Why Does a Knife Cut The Way it Does? A study of how a knife cuts is very important to knifemakers. Unfortunately, whether you are a newbie or seasoned maker, edge geometry can often be a murky subject. Let's face it there are many possible angles, grinds, thicknesses and steel properties as there are uses for a knife. Like most things, the answers come when you test your knife designs. When you are happy with the way your knives cut, you will have come to understand what works for the application. Hopefully we can start on the right track with some concepts and examples of cutting edges, what they are good for and why they work for some purposes and don't work for others. 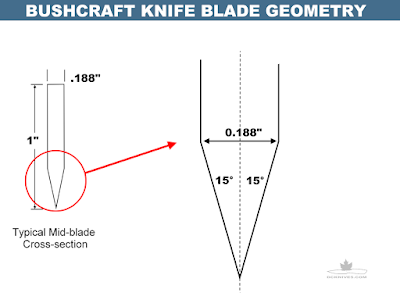 This essay is not intended to give you perfect edge geometry, rather to give you the general knowledge so that you can determine where to start when designing knives for a single or range of purposes. A filleting knife is not a cleaver, just as a ax is not a hammer! 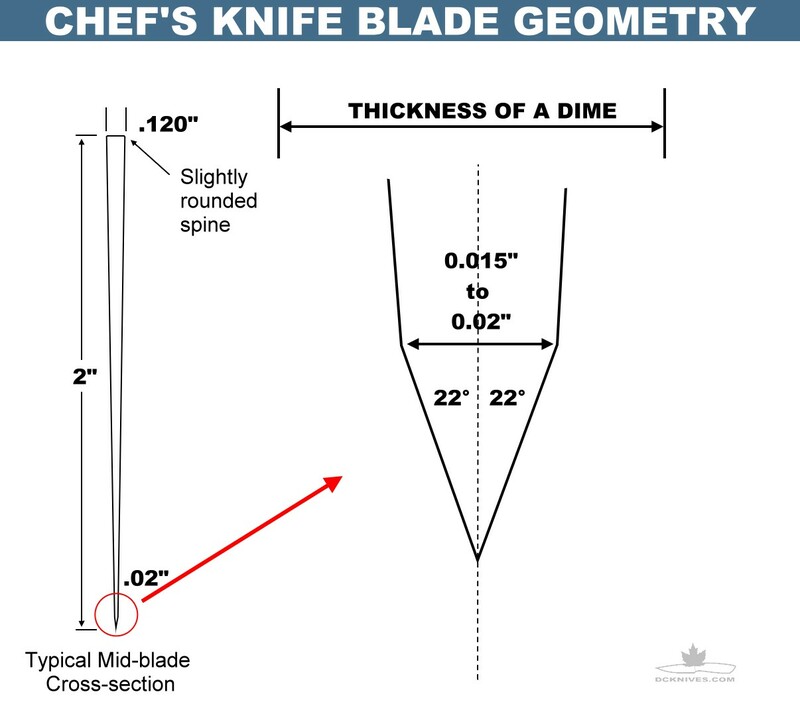 A blade's steel and hardness influence the appropriate angles that make up good cutting edge geometry, but most importantly, the application of the knife should primarily drive the choice of edge geometry. Is it being used to precision slice raw fish or hack bones? In garden variety knifemaking, we are faced with only a small number of different grinds, but it is interesting to know what characteristics are encouraged by various shapes. 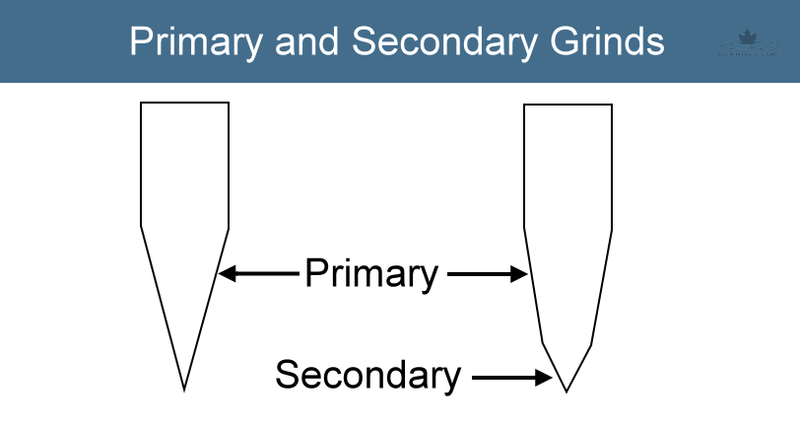 For most knives we see primary only or primary and secondary grinds (bevels). 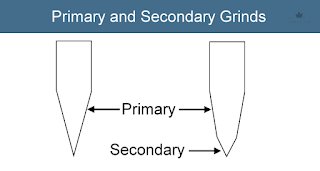 Primary Only Grinds have two faces that meet at the cutting edge. That's it. Some Japanese and Scandinavian knives are famous for having a primary bevel only. I have broken these into single grind and double grind. The Single Grinds shown below. A chisel concave will be a crazy fine slicing edge, but will be fragile and chip or roll easily. 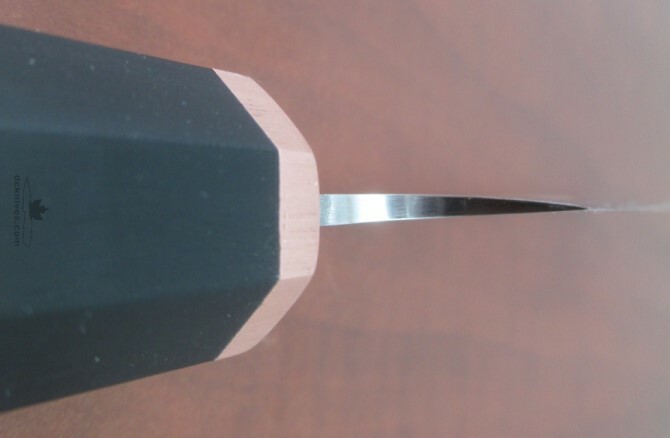 A chisel convex or chisel flat can be seen in sushi and sashimi slicing knives. These slice through softer materials like a razor blade would. Chisel flats are ubiquitous in mass produced safety razor blades and some utility knife blades. These are incredibly sharp but delicate cutting edges and cutting into a hard material will damage the edge. Single grinds are not limited to chisels as you can find high angle versions of them on scissors, lawn mower blades, planer blades and paper shears. 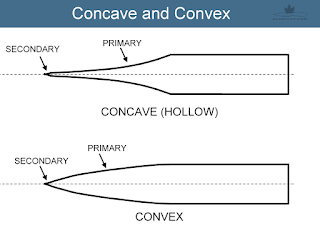 Although technically there will always be some secondary bevel, even if only visible with a microscope; for the purposes of discussion, let's call bevels INTENTIONAL. This brings us next to the primary only double grinds. These feature only one bevel that comes to a point at the cutting edge, but are ground on both faces. 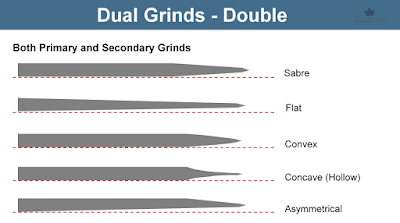 Note that some of the latter three grinds are asymmetrical, meaning the grind differs from one side of the blade to the other (again intentionally), like the chisel. Although they look like a chisel, I like to differentiate these as one face is not 90° to the spine like they are in the single grind chisel types. A common variety primary only grind is the Scandinavian or "Scandi" grind often found in Swedish Mora knives and Finnish Puukko knives. In order to maintain the durability of the edge the angles are higher than dual grind (primary and secondary beveled) knives. Scandi blades are robust and relatively easy to sharpen with a flat stone. The blade only need be moved across and into the stone at an angle consistent with the primary bevel. The primary bevel helps 'hold' the edge true to the stone so it is less likely to wobble and create a poorly formed cutting edge. 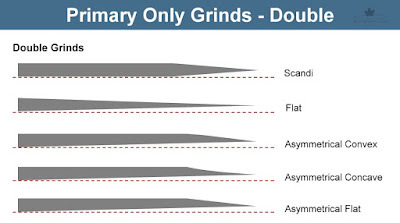 Asymmetrical grinds are often intended for right handed or left handed use. A rule for determining whether a knife is right or left handed can be this: When holding the knife by the handle and pointing the tip away from you; if the bevel is ground predominantly on the right side of the blade, it is a right-handed knife. The converse is true for left handed knives. Author's KN16 Petty asymmetrical convex ground for right-handed use. When two distinct bevels make up the cutting edge geometry, the cutting part is called the secondary bevel. 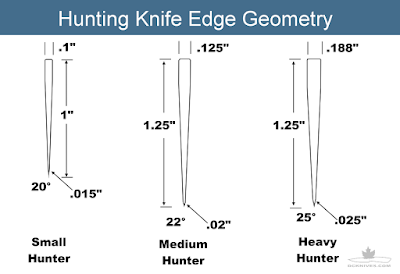 Many knives have this basic primary/secondary geometry from hunting knives to kitchen knives. 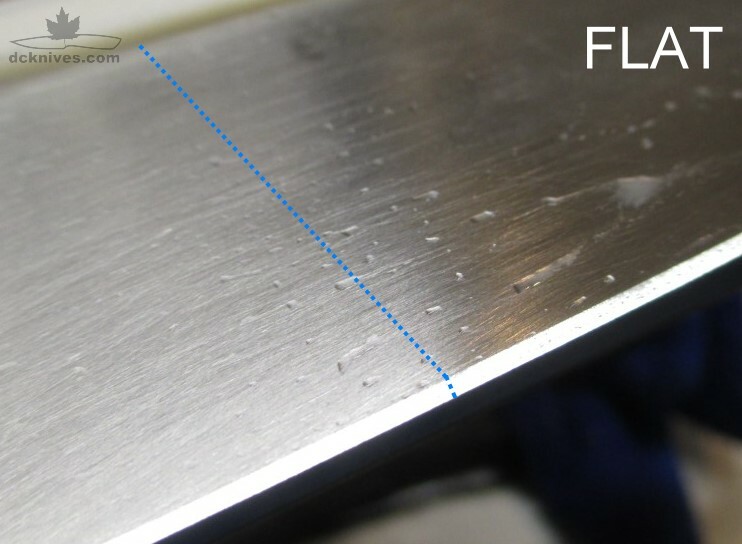 The purpose of the higher angle secondary bevel is to increase the durability of the edge. 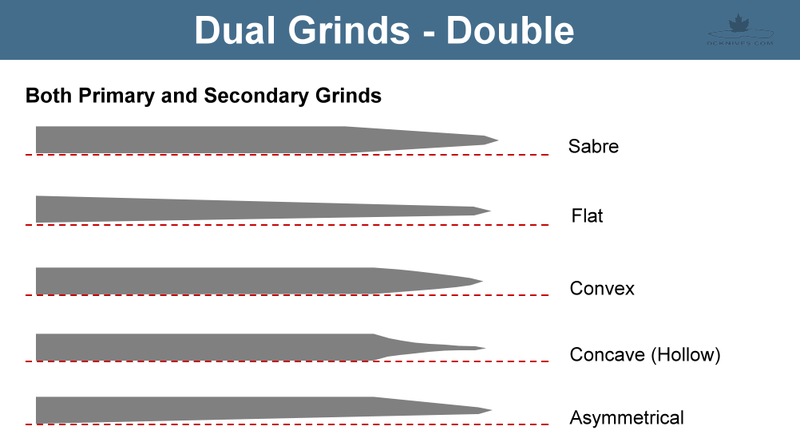 As you can see, the sabre grind is like a Scandi grind except for the secondary bevel. It is very common in hunting knives and tactical knives where a strong spine is required. The flat grind is probably the most common and is found on all kinds of kitchen knifes, hunting knives, skinning knives and so on. It offers a good balance between cutting ability and strength. The Concave (hollow grind) cuts extremely well, but lacks durability. Straight razors use this type of geometry. Borrowing from the same basic shape you may find limbing hatchets. The Convex grind offers durability with mass behind the cutting edge. It sacrifices some cutting ability for this durability. Yes, there can be more than two bevels. 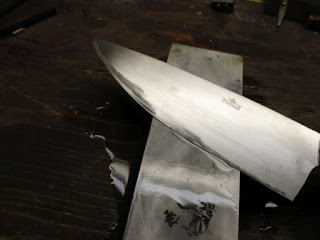 A third bevel would be called a tertiary and the forth a quaternary bevel, and so on, but these are rare in knifemaking. 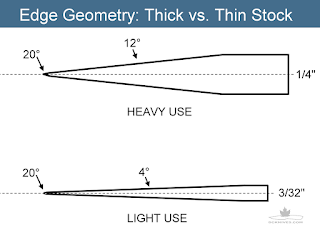 When setting the cutting edge and sharpening we say the angle of the cutting edge is 1/2 of the total angle. That is, when we say 15 degrees, we mean 15° on each side. 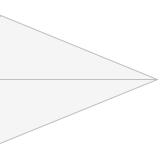 For symmetrical blades, the total angle is 15° + 15° or 30°. We don't normally set our sharpening equipment up for 30° though as we hone one side of the blade at a time. "I pop my knife into my Lansky and use the 20° slot and start." This 20° is really only ONE SIDE. 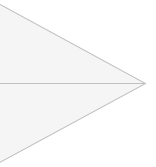 The total angle for a common knife will be two times 20° or 40°. 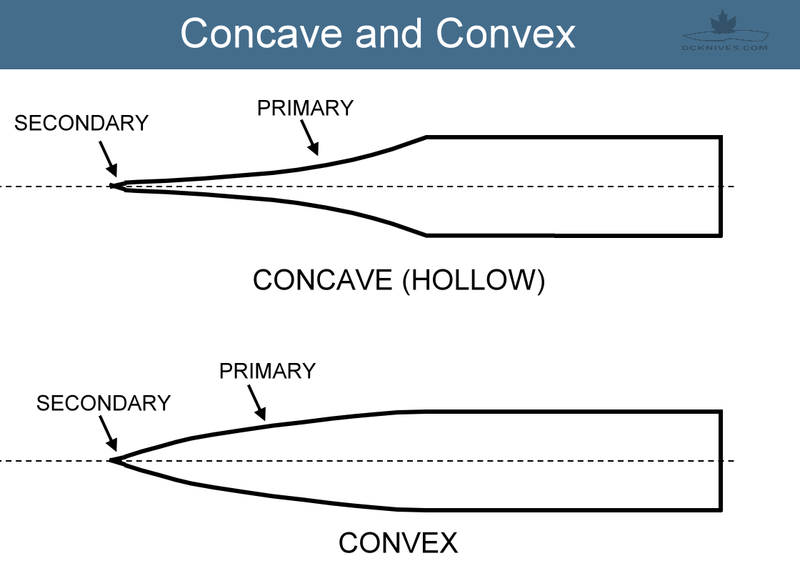 There are cases with primary only single (such as chisels) where the total angle is the same as the angle of the cutting edge. The angle of the cutting edge is largely set according to the intended use and the hardness of the steel. 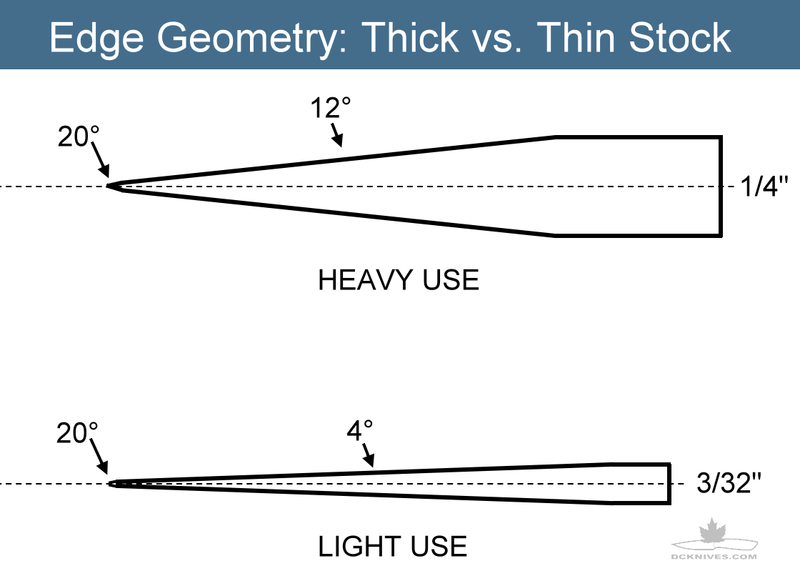 A very low angle cutting edge will slice very well, but is more prone to being damaged when impacting hard objects. This is where the blade hardness works with the angle to reduce the possibility of rolling or chipping. An edge intended to take abuse will need a higher angle to have a chance at surviving. Here are some example ranges for cutting edge angles and their uses. 12° to 17° - Fillet knives, scalpels, razors. hard Japanese kitchen knives. 18° to 25° - General purpose, European kitchen knives, hunting knives. 26° to 30° - Pocket knives, hunting knives, bushcraft knives, where more likely to be abused. 31° and higher - Machete, camp knives, hatchets. Durable, hacking edges. 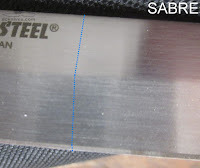 Before you set the secondary edge on sabers and flat grinds, check the thickness. It should be uniform over the length of the soon-to-be cutting edge. I could use coins and hairs to describe the thicknesses, but an inexpensive digital caliper is far more precise and really has become essential to the knifemaker. A digital caliper provides a simple way to check edge thickness before grinding the secondary bevel. Inexpensive (under $20) and accurate enough for knifemaking needs. 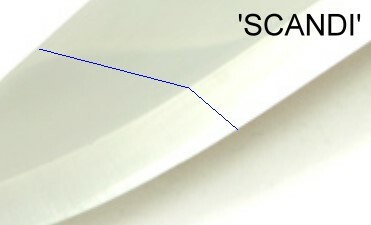 The angle of the primary bevel is chosen based on the intended use of the knife, the blade thickness and grind height. 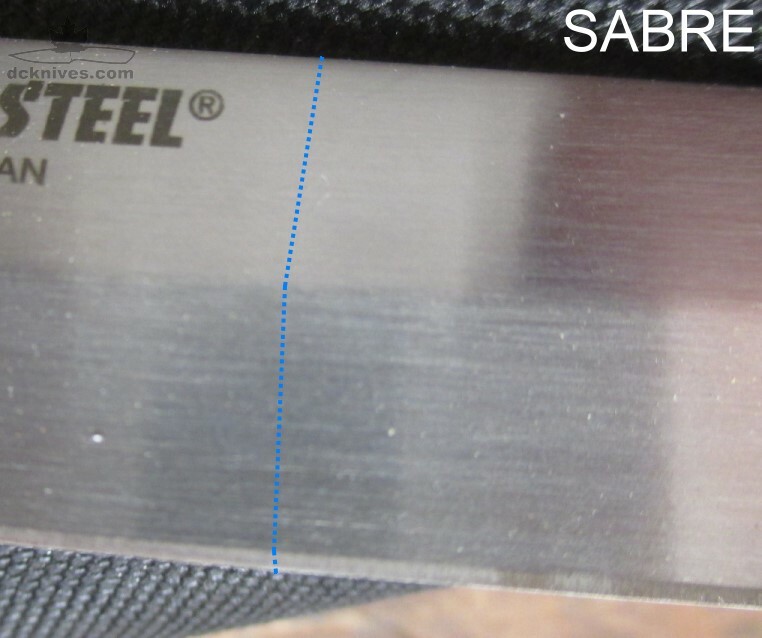 This angle is in relation to the thickness of the stock and the grind height or how far the grind "goes up" the blade. A heavy use bush chopper may have a thick spine and rigid blade. A paring or filleting knife will have a thin spine and low primary angle bevel. You can compare the two shown here to get an idea of what the two extremes offer. There is a simple formula for finding the angle that is required to achieve a set grind height based on the thickness of the stock you are using. This grind angle calculator can be helpful if you are using a jig to set the primary bevel angle. I have made several chef's knives so I thought I would start there with the most basic of grinds, the full flat grind. 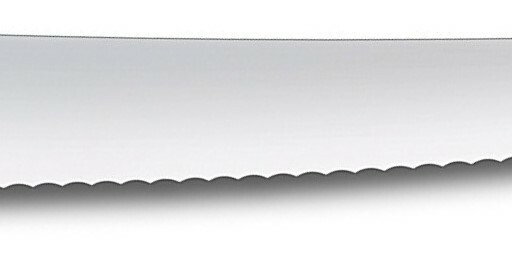 Typically, a larger German style chef's knife is made from 1/8" (0.125") stock and the primary bevel is flat ground. Some prefer to grind this bevel to about 0.04" (around the thickness of a dime) before heat treating. After heat treat, one will further grind the primary bevel to around 0.02" or about 1/2 the thickness of a dime. Then finally grind the secondary bevel or cutting edge at between 20° and 22° for about a 45° total angle. Spine: Not exactly related to cutting edge, unless you cut your fingers, a slightly rounded spine will be favorable on the hands when pinch gripping the blade on a chef's knife. However, at least one maker has told me his customer likes a sharp spine to better pinch grip the knife. To each his/her own. Some bushcrafters love a very square sharp spine for scraping bark from trees and roots. Avoid rounding the spine if this sharpness is desired. Sharpening a secondary, unlike the Scandi, will require the user to angle the blade off the primary bevel which can make the task more difficult. Some guides are available that clamp on the blade to guarantee the angle. Others like to use a matchbook as a guide. Unfortunately, matchbooks are a common as hen's teeth nowadays. The goal here is a consistent angle. When the angle changes, the secondary is rolled over and not as precise as it should be. In the case of a classic bushcraft knife, the blade is thick, often about 5/16" (0.303"). Generally these knives feature only one bevel, that is the primary grind goes all the way to the cutting edge. 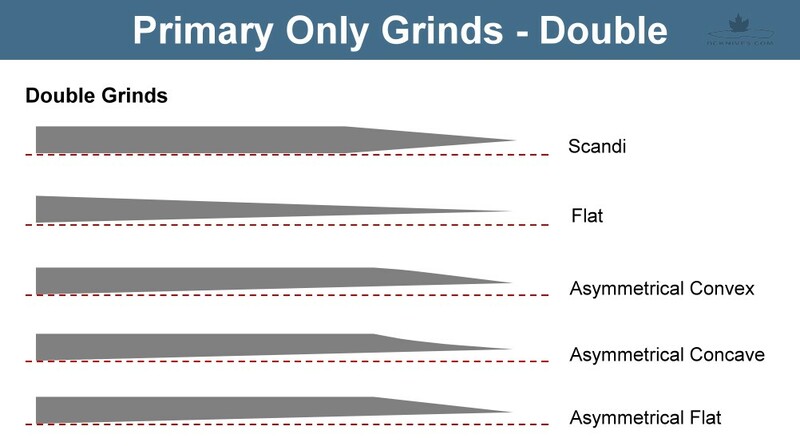 Sometimes this grind is called a Scandinavian or "Scandi" grind. As the bushcraft knife is used for general woodworking duties including, scraping, splitting, carving, chopping and slicing it's blade is quite thick. The angle allows for a reasonable variety of tasks the thick spine for batoning or splitting. This cutting edge is however less durable against hard materials. 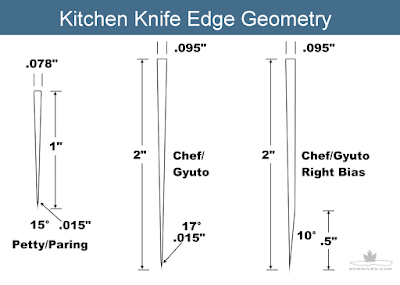 Here are some basic edge profiles that I like to use for kitchen knives. 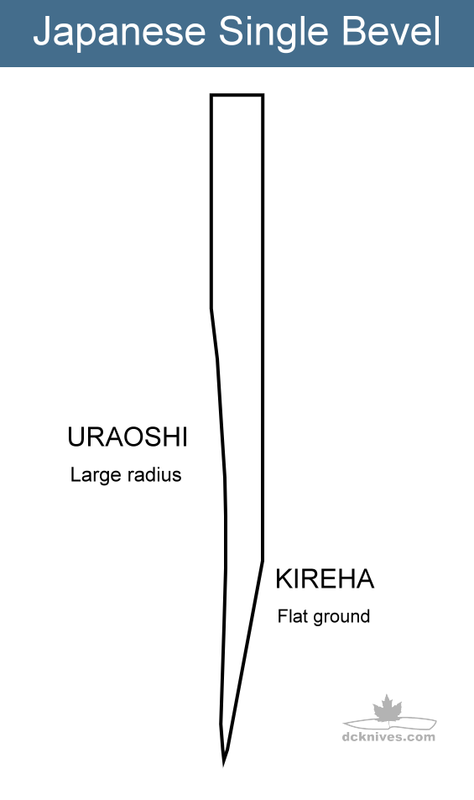 These dimensions are taken at the heel as viewed from the rear of the blade. 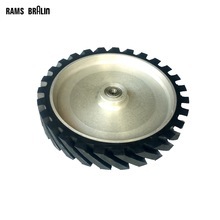 These profiles are based on cutting tests and perform how admirably for their applications. Do experiment with your blade designs and make something that works. You will know when it works by how effortlessly it cuts. 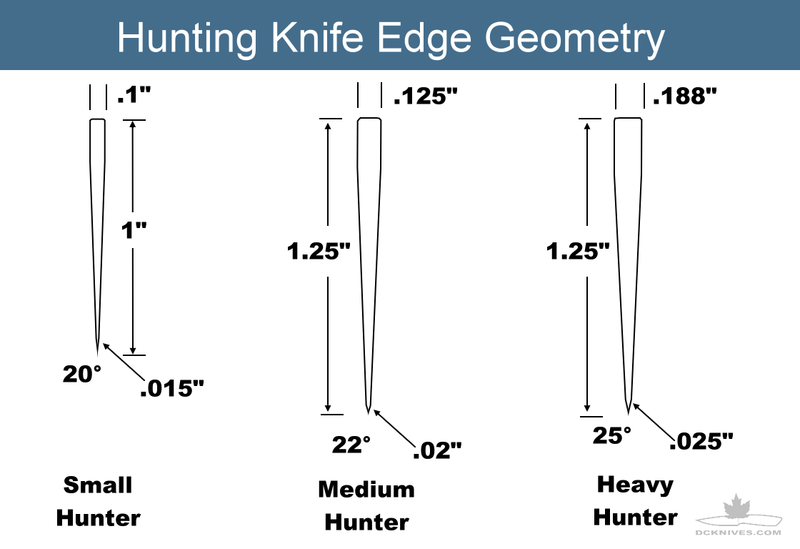 Here are three basic edge profiles for hunting knives based on 3/32", 1/8" and 3/16" stock. The angles are based on the thickness of the blade and potential uses. Hunting knives are not specialized in the sense that they are going to be used for many field tasks. 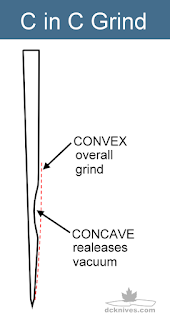 A concave in convex (sometimes called an S grind) is well suited for slicing wet foods. The overall convex offers great slicing characteristics while the concave provides the vacuum release to prevent wet foods from sticking to the blade. 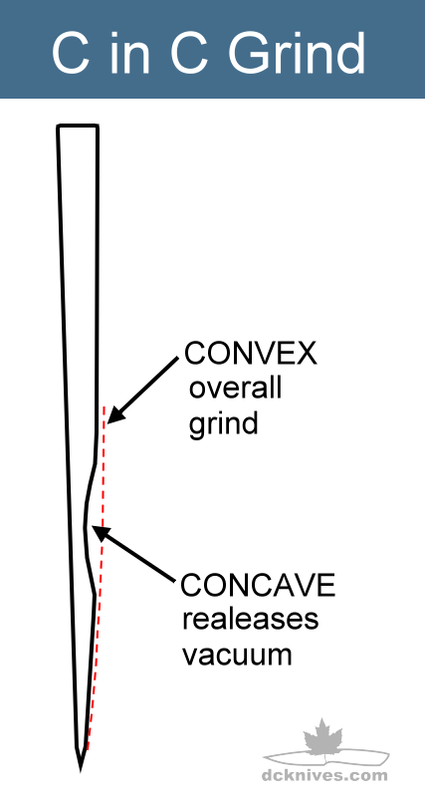 The graphic shows a right handed concave in convex as seen from the heel of the blade. Traditional Japanese single bevel grinds often feature a large radius scooped out backside to release food. Scalloping is the intentional removal of part of the primary bevel, which in turn creates a surface that acts like a vacuum release when cutting certain foods. Wet foods want to stick to the blade and these scalloped areas break the vacuum and allow the food to fall free from the blade. Santoku style knives commonly feature scallops or cullens, however the scalloping can run along the blade as well. Serrations are teeth-like ridges that transform a knife essentially into a saw. We quite often see serrated edges on bread knives, steak knives and combination blades on hunting/survival knives. A knife must perform its intended function. 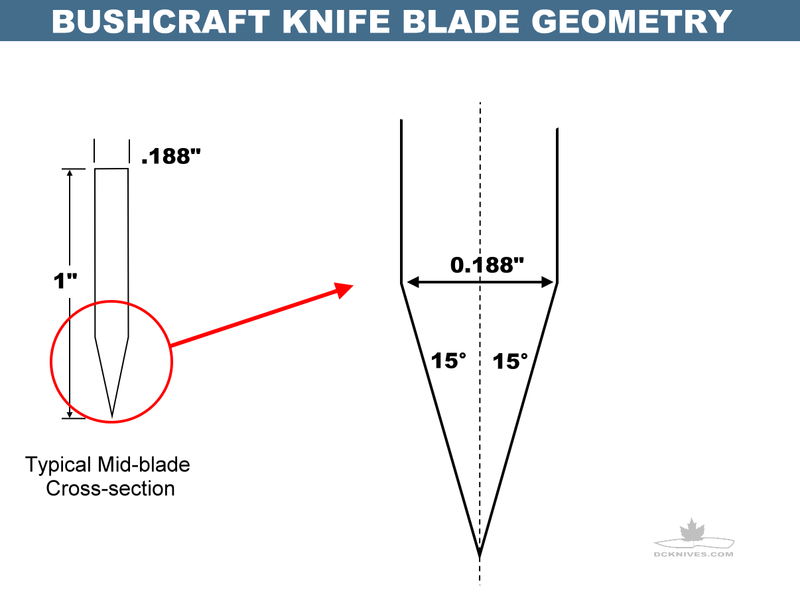 There are many factors to consider that are related to a blade's shape and edge geometry. A knife that's wielded all day long at a hog processing plant isn't going to weigh 2 lbs. The operator will simply pit it aside and find something that cuts that involves far less effort. The length, thickness and bevels of the blade directly influence the weight of a knife. A backpacker may not want to carry a two pound "Rambo" knife with a 12" blade as every ounce counts when you're walking all day. As a rule, thin knives cut better. So if you can, make your knives as thin as practical for the application. Obviously a millimeter thin cleaver is not going to go over so well, but use your judgment and test your designs. Collect feedback from your users and strive to make the best possible knives you can. So you believe a hunting knife should be atleast 20 degrees on each side bring the total angle to 40?? Yes, in the 20° to 25° range. If you feel it will be used for more abusive work then go with the 25° angle. 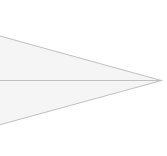 Or, if it will be used primarily on softer materials, proteins etc, then you can go with the 20° angle. A good average is between 20° and 25°. Most systems like those made by Lansky et al have both a 20° and a 25° slot to help fix the hone angle. Yet a bushcraft/scandi knife can have a 15 degree blade? I usually make Scandi style knives with 12-15 degree angles on both sides of the blade. It doesn't make sense for us to give a bushcraft/scandi knife a finer edge than a hunting knife or even a chef's knife. Could you help me understand why you think this is the case? Again going back to the purpose of the knife is important. Bushcraft knives are intended primarily for wood working. Having a 15° bevel zero grind edge will have a tendency to roll if it encounters hard materials. 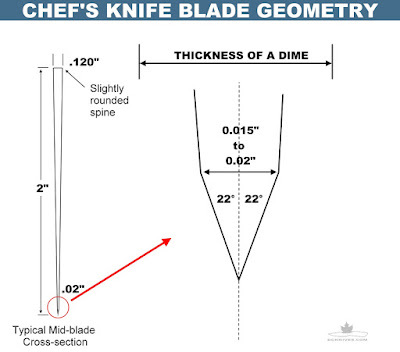 Whereas a hunting knife (or chef's knife) has a higher angle secondary edge and it is expected to come in contact bone or other hard materials from time-to-time. Low angle zero grind blades are great at slicing, but the trade off comes with reduced edge durability. 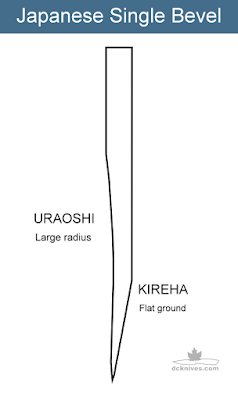 An example would be a single grind yanagi which is intended for slicing boneless proteins. I don't think a yanagi's super-fine edge will like clunking into a bone. what is the mathmatical model or formule of kitchen knife design? I have not found there to be any single model or formula. Each knife has a purpose or range of purposes. The uses will dictate the best cutting angle and steel hardness. One could argue, the softer the material the knife is meant to cut the lower the angle of the cutting edge and the harder the steel can be. 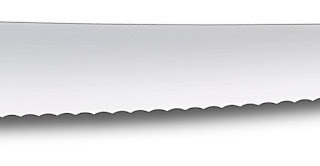 A boneless protein slicing knife can have an 11° edge and a hardness of 63C. This edge would be chipped easily if used as a butcher knife. So each application has its own ideal properties. I am now working on designing a knife for kitchen machine to cut vegetables(slice shape)for salad.i want to calculate the strength affecting on the cutter and vegetables and thus deduced the angle of cutting and manufacturing materials and motor speed of kitchen machine(mathematical analysis of design) can you help me please? Unfortunatly, I cannot help with the design of the machine. I can offer some advice for slicing vegetables. A Japanese nakiri bocho is extremely efficient at cutting vegetables. Make the blade about 2 mm thick and 25 mm tall. 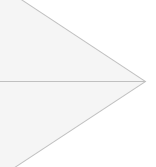 Set the angle of the primary bevel (no secondary bevel) to about 11°. The hardness should be around Rockwell 59 to 60 C.
Hello, thank you for the excellent information! Interesting question. I have never used a knife with such characteristics. The single bevel at 25° is essentially a chisel. I don't think that geometry would be nearly as flexible as the traditional low primary/high secondary geometry of a hunter. If there was an application example right-handed sushi knife it would fit the bill. In my experience with single bevel kitchen knives they take a little getting used to they do like to pull when in the direction opposite the bevel. One way to know for sure is to make one and test it out. If you do, kindly let us know the results! Hi, sorry I worded my previous question very badly, in hindsight! What I meant was, would a "Scandi" style grind angle of 20-25° (so 40-50° total) make a functional hunter? Or does it only really function effectively as a general purpose/hunter when there's a secondary bevel?